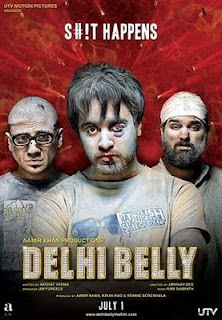 After a light, youthful album for "Luv Ka The End", composer Ram Sampath goes all experimental with his next soundtrack for the film "Delhi Belly" and from the compositions he has created, the song "D.K. Bose" stands out, becoming quite a rage these days among youth. The album offers 10 tracks of diverse kinds. It opens with the song that is on everyone's lips nowadays - "D.K. Bose". Crooned by Sampath himself, the track with quirky, interesting and double meaning lyrics has already become quite popular. With a rock-infested composition and an energetic, pacy feel, the song has become a favourite of youth and has become an instant chartbuster. Next is "Nakkaddwale disco, udhaarwaley khisko", a very different kind of track with unusual lyrics. It has been sung by Keerti Sagathia and is only an average number. "Saigal blues" brings back the era and style of legendary singer K.L. Saigal. The track that has Chetan Shashital behind the mike is sung in Saigal's style but with a contemporary touch. The composition is under the genre of blues that bring about a certain poignancy in the song. On the whole, it's a mix of today and the eras gone by. "Bedardi raja" by Sona Mohapatra is a rustic, masses song and seems to be an item number in the film. It's a simple composition and offers nothing great. The track also has a grind mix, which has more beats than the original but the basic character and the pace of the song remain the same. Another eccentric track "Jaa chudail", sung by Suraj Jagan, is a rock track from the word go. It might be liked by hard rock lovers. "Tere siva", the only soft, love track of the album, has been voiced by Sampath and Tarannum Mallik and is a simple romantic number with a touch of rock. However, the orchestration is not very strong. A good hear. "Switty tera pyaar chahida" is a Punjabi music lover's delight. Strong beats, Punjabi lyrics and lots of energy make this track a total dance number. Crooned by Keerthi Sagathia, this song gets the listener hooked and is quite likeable. It also has another version called "Switty punk" that has the addition of Sampath and is higher in energy and fun. Then there is "I hate you (like I love you)" that is a song by Keerthi Sagathia again with ample support from Sona Mohapatra. It is a mix of various genres of music and multiple influences. Starting as a slow-paced Indianised track, it goes on to become fully Western in its feel, music and lyrics, then takes the guise of a typical Bollywood song in the 1970s and finally ends like a qawwali. Very experimental and energetic at the same time. On the whole, the music is unusual, breaks monotony and is far from being typical.